“We actually closed on a boat today, we own a boat,” says Heather Hedges. Hedges is Marketing and Tourism coordinator for the fledgling Rainforest Islands Ferryservice as well as the city of Coffman Cove on Prince of Wales Island. She says the price was just over 2 million dollars for the 160 foot vessel, which is currently still in the Gulf of Mexico. 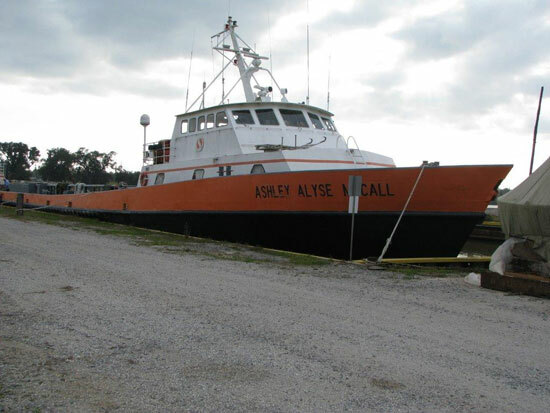 Built in 1992, the Ashley Alyse McCall was owned by SEACOR Marine which transports crews and supplies to offshore oil rigs. The vessel is expected to cruise a bit faster than larger Alaska ferries, while using substantially less gas. Hedges says she’ll be renamed the Rainforest Islander. “We will have room for 70 passengers and 14 vehicals plus freight and baggage. We’ll have our plans for retrofit and overhaul done this Friday and get those out to the shipyards and hopefully have a plan of attack for which yard it’s going to go into in the next two weeks,” says Hedges. They hope to have the service running by Mid-July. The new ferry’s ports of call include Coffman Cove, Wrangell, and the South Mitkof Terminal about 25 miles from Petersburg, as well as the Saxman terminal near Ketchikan and Meyers chuck on the Mainland. The boat will run operate Monday through Saturday and stop in each community several times a week. “That’s definitely our hope to promote linking between the different, you know doing sample itineraries that will link up with IFA so they come one way and leave the other way,” Hedges says. A 3 million dollar loan from the US Department of Agriculture is covering the Rainforest Island’s vessel purchase, overhaul and other startup costs. That includes vans to transport foot passengers on the Prince of Wales and Mitkof Island road system. The new service is overseen by the North End Ferry Authority in Coffman Cove. That’s the only community that’s chosen to take part in the Authority board so far.